YouTube Channels area popular for music, Movies and compltely entertainment. In India mainly people uesd to search YouTube Channels in India for entertainment through YouTube channels and some other Telivision Entertainment. 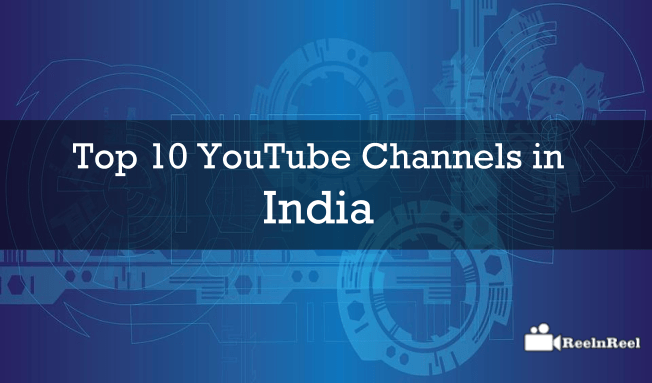 Here are the Top 10 YouTube Channels in India. T- series has become India’s best YouTube music channel. Not only music this channel is known for various types of entertainment programs. T-series play a role in film production and distribution. This channel 3rd place in views rank and subscription rank 34 in India. T-series plays all types of music in different languages across the world. It has 15,485,860+ subscribers and 14,477,123,130+ views. India’s third most watched YouTube kids channel. Mainly designed for Nursery kids, infants, pre-school children with colorful animations and surprising things.Kids immerse themselves watching the Rhymes and songs with mild music. ChuChu TV focuses on creative things to learn from their video and the whole family can enjoy with the songs. This channel has 7,812,209+ subscribers and 7,344,749,236+ views. Zee TV is Television Entertainment channel in Hindi designed for Mumbai and Maharashtra. India’s first satellite channel and created by Zee Telefilms Limited.The Largest media in South Asia areas covered by this channel news, movies, music, tv shows. The Highest view rate goes to Zee Tv serials. It has 5,385,993+ subscribers and 7,091,156,852+ views. Sony Entertainment Television channel owned by Sony Pictures Networks based on our national language Hindi. This channel has more than 20 sub channels. SET India uploads crime portals, serials, trending shows, Kids shows, comic videos, exclusive celebrity interviews. It has 9,648,074+ subscribers and 5,693,000,773+ views. EROS Now is India’s largest entertainment channel uploads all blockbuster hits, latest updates. This is an official YouTube page of the EROS Now entertainment channel. It gives unlimited access to audiences with Bollywood hit movies, classic, action and behind the screen videos. EROS Now has subchannels in all languages with premium quality movies, music, a complete entertainment channel. It has 5,318,779+ subscribers and 4,509,688,699+ views. CVS 3D Rhymes include Nursery Rhymes, moral stories, short films, 3D songs, everything in a three dimensional format. This channel stuff has in different languages in an understandable way. The popular collection is “finger family”,“Five little monkeys” and animation rhymes and stories. This channel has a vast collection of Rhymes for kids. 3,965,506+ subscribers and 3,870,635,838+ views. Videogyan is popular for 3D rhymes, animation, huge collection HD Rhymes and songs. Kids love to watch this channel with colorful animated video’s, color songs event infants, toddlers love to watch. Videogyan is for all ages kids enjoy with family and friends.Five Little Babies’ song composed in different versions with number toys.Little bus stories and finger family songs get millions of viewers all over the world.3,629,460+ subscribers and 3,050,362,487+ views. Yash raj Films has started this channel film distribution and production company.This channel has Bollywood old to the latest movies, huge collection of HD, music, including classic, traditional, latest hits and albums. Curtain raiser shows, making and behind the screen videos, Bollywood celebrities event everything related to films stuffed in this channel. It has own music with the company labels. 4,418,427+ subscribers and 3,040,001,025+ views. Bollywood biggest television entertainment channel. Channel mainly focuses on an Entertaining serial episode like live and telecasted episodes.All TV shows like comedy shows, dance competitions, celebrity shows, interviews and many more. This channel has 5,302,678+ subscribers and 2,927,983,224+ views. Zee music company a sub channel of Zee TV network, only Bollywood Hungama channel.This library has over 220,000 hours of content, views from all over 171 countries. The music library has all audio and video type of Bollywood film songs. This channel has android and iOS apps to download in all portable devices.This channel has 4,142,333+ subscribers and 3,036,385,559+ views. What is Dynamic Ad Insertion (DAI) ?